Tag Archive | "Bronze Puffer"
The Golden Puffer (Auriglobus modestus) is also called the Bronze Puffer or Avocado Puffer by tropical fish keeping enthusiasts. The Golden Puffer has an unusual shape for a puffer fish. It has is a sleeker, more streamlined, club like body with beautiful iridescent golden, green, to bronze hued colors. Even though the Golden Puffer is a freshwater fish, they exhibit an unusual characteristic that is more common to marine fish. Their iridescent body colors modulate between green, gold and bronze. 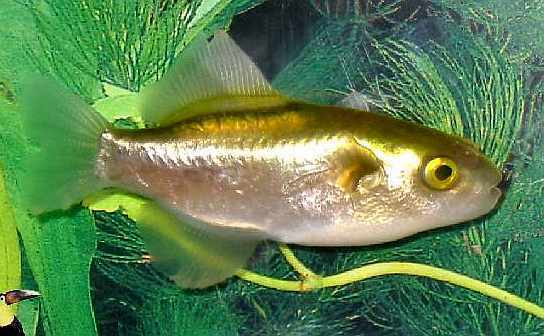 The iridescent gold green body color gets progressively lighter towards the belly, and their fins and tail are translucent. Golden Puffers are native to Thailand, Malaysia and Indonesia where they are found in the swifter moving currents of medium to large rivers. They are also commonly found in flood estuaries. The Golden Puffer is an aggressive fin nipper that is better kept in a single species aquarium. Its more streamlined body enables them to swim much faster than other puffers and many other fish, therefore they should never be housed with slow moving, long finned species or with any type of decorative crayfish, shrimp, or snail. Any invertebrate placed in the same tank with a Golden Puffer will be on their menu and is usually immediately dispatched. Most other fast moving community fish such as giant Danios, will do fine provided there is sufficient tank space and places for them to hide. The Golden Puffer should be housed in an aquarium of at least 20 gallons, filtered with a canister filter that can change the tank water over 6 to 10 times per hour, and set up with at least one rotating power head to simulate the strong currents that they are found in in nature. Golden Puffers are intelligent, curious little fish that like to root around a lot and should be housed in a tank that is well aquascaped. They prefer a densely planted tank with a sandy substrate, some floating vegetation, driftwood roots and caves for hiding, and low lighting conditions. 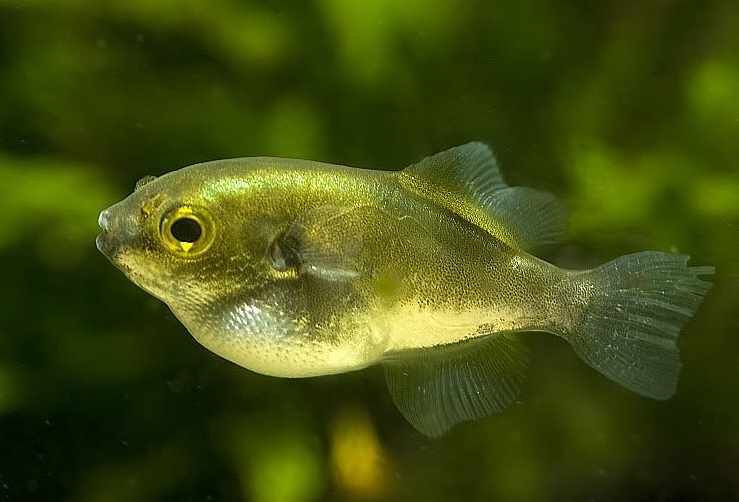 If you choose to house you puffer with other fast moving fish, dense vegetation and an abundance of hiding places is essential for their survival. Like other puffer fish, the Golden Puffer lacks scales and gill covers. This makes them more sensitive to changing water conditions and more susceptible to disease, nitrite, nitrate and ammonia levels. The Golden Puffer is especially sensitive to nitrites and ammonia and in an aquarium environment, they should be provided with weekly water changes and highly filtered water. All puffer fish are messy eaters, which is why high output canister filters are routinely used for keeping freshwater puffers. Obviously, the Golden Puffer is not considered a good community fish. Because they are faster than most other puffer fish, they have a tendency to become extremely aggressive, despite their diminutive size (less than 4″). Feed Golden Puffers an omnivore diet of live and frozen foods such as shrimp, ghost shrimp , bloodworms , krill, seeds, and snails. Although they can be trained to eat flakes, freeze dried foods and pellets, they need a varied diet to keep them healthy and to keep their teeth worn down. All Puffers have strong teeth that keep growing throughout their lives. The Golden Puffer is prone to overgrown teeth and must be fed shelled live food on a regular basis to keep their teeth worn down. Snails and other shelled foods fed on a daily basis will help to wear down their teeth but if the teeth get too long, they will be unable to eat and their teeth must be trimmed manually. You can do this by adding 3 drops of clove oil per liter of water to temporarily sedate the puffer so it can be handled more easily. Clip their top and bottom teeth with a cuticle clipper and put the puffer back into the main tank in front of a power head current until it revives. This little procedure may need to be done 3 to 4 times a year. Golden Puffers are relatively rare but when available for purchase are available in size up to 4″ in length.